White Cedar is the next best thing to a resin soaked pine knot for starting wood fires and makes for a great natural kindling source. 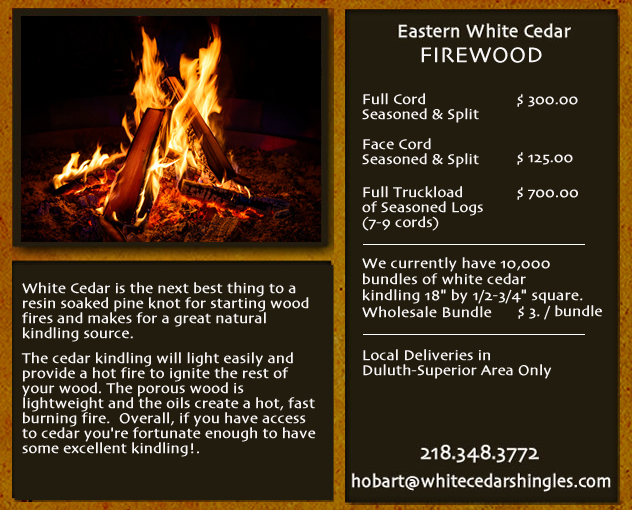 The cedar kindling will light easily and provide a hot fire to ignite the rest of your wood. The porous wood is lightweight and the oils create a hot, fast burning fire. Overall, if you have access to cedar you're fortunate enough to have some excellent kindling! Many people ask "Are a 'cord' and a 'face cord' the same?" The difference between the two is that a full cord of firewood is an amount of wood that fills a space equal to eight feet long by four feet high by four feet deep. ... A face cord of firewood is equal to a single stack of firewood that measures four feet high by 8 feet long by however deep the depth of the firewood is. A face cord refers to a stack of cut and split firewood 4' high by 8' long by the length of the firewood, usually 16”, 20” or 24”. In theory, a standard cord should yield three 16” face cords or a volume of 128 cu.